AUTUMN. There's something about Autumn that always captures my attention. 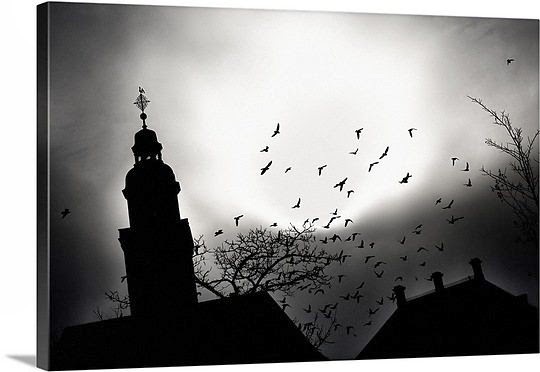 Once, I saw a painting in which silhouette of black birds flying and roaming around the sky. When I bought this bird print dress, I remembered that painting and thus became my inspirations. This painting isn't the exact thing that I remembered, because I can't get the autumn feeling. However, it's certainly a beauty, right? Lately, I find that painting has become one of my favorite sources to gather inspiration for my next outfit post. It became a personal challenge to me - turning the painting into fashion, but it's super fun! Maybe you should try it too! Besides, this tip can help you, when you are stuck with no outfits inspiration whatsoever. I'm playing with patterns, the flying bird as a dress and the ribbon tights to add some cuteness in the outfits. Choosing camel and creme color combination is a way for me to get into the Autumn mood. I love this shoes so much. Great outfit and nice color combination. Have a great day. Love it! Outfit matches perfectly to the painting that you were going for. I love to heard that you love writing!! I also love it too hehe. now I'm making a novel with my friends, it isn't finish yet but, if you have time in the future, can you read it and give comments on it?? hehehe thanks before!! I really like your outfit posts. It's always dreamy and romantic. Though I've never experienced it myself, autumn is one of my favourite seasons. Loving the neutrals on your ensemble. I really love the tights with the dress! Beautiful.